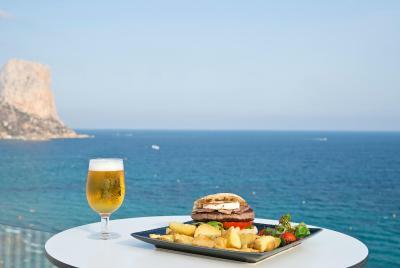 Lock in a great price for Hotel Bahía Calpe by Pierre & Vacances – rated 8.3 by recent guests! Great location next to the beach. 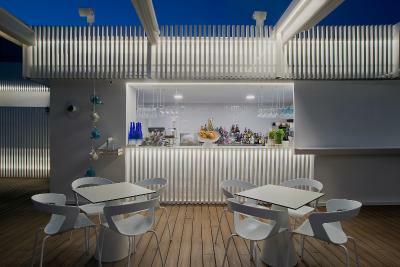 Nice roof top terrace / bar. Good and extensive breakfast although only till 1000 and the restaurant gives a large canteen feeling. Service professional and friendly. We had a sea view which I recommend at the second floor and therefore it seems we had a slightly bigger terrace than those staying on other floors. 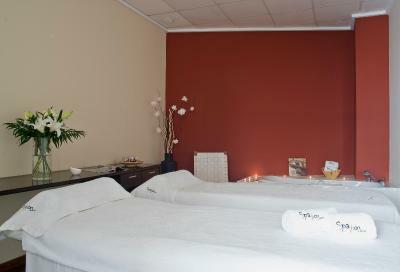 Good location, friendly and helpful staff, clean and comfortable rooms. The beds were very good, firm but not too hard. We all had excellent sleep every night. Couldn't hear any noise from adjoining rooms or from the corridor. Excellent buffet breakfast, loads of choice and vegetarian options were tasty. Nice quality eggs too. The property is in great location just around the beach. The stuff was friendly and helpful throughout the whole stay. I have come across some past reviews who claimed that beds were uncomfortable; however I have not experienced any problems with that. The food is excellent, the breakfast could probably benefit from a little more variety, but the dinner was superb. Overall, would definitely recommend this hotel. Excellent location with easy access to both nearby beaches and downtown area. Very helpful and pleasant staff - our stay wouldn't be so nice without all those people. Great hotel, lovely rooms with a great terrace, would definetley recommend paying a bit more for the great sea view. 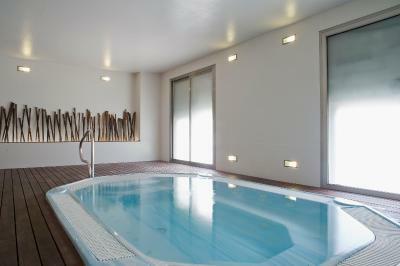 The spa was nice and relaxing, and the roof top pool/bar is spectacular, with a great selection of food and drinks. Awesome location right next to the beach and the town centre. We didn't eat in the restaurant so can't comment on that. The staff were very friendly and helpful, and let us leave our bags there after we checked out. 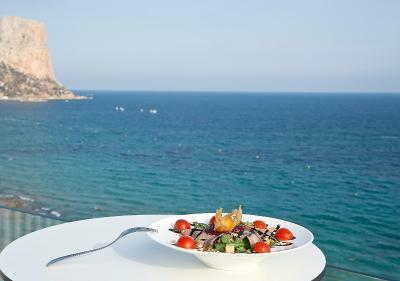 Hotel Bahía Calpe by Pierre & Vacances This rating is a reflection of how the property compares to the industry standard when it comes to price, facilities and services available. It's based on a self-evaluation by the property. Use this rating to help choose your stay! 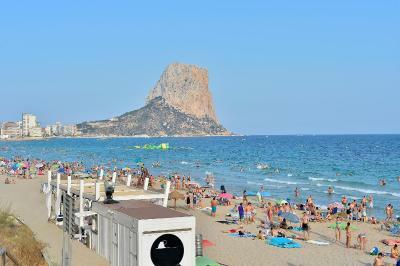 One of our top picks in Calpe.Overlooking Playa del Arenal Beach, this hotel enjoys great views of Ifach Rock. 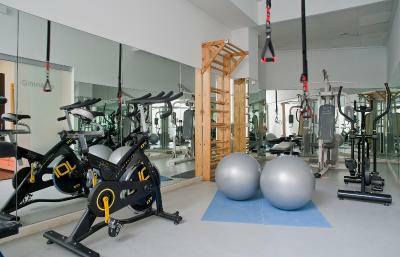 It offers a fitness center, outdoor swimming pool and rooms with free high-speed WiFi and a private balcony. 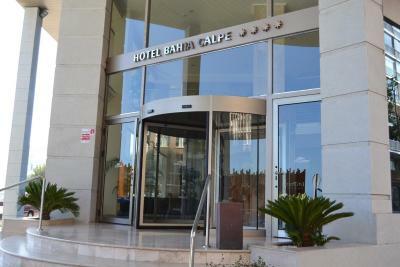 All of the rooms in Hotel Bahía Calpe are fully air conditioned and heated. 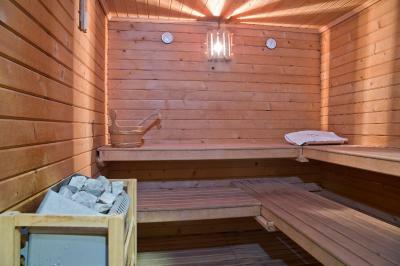 They have a TV, mini-bar and safe, as well as private bathrooms with hairdryer. The restaurant has a show kitchen and offers Mediterranean and international dishes. 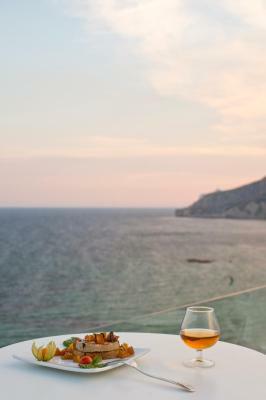 There is also a bar where you can get a snack or a drink and 24-hour reception. 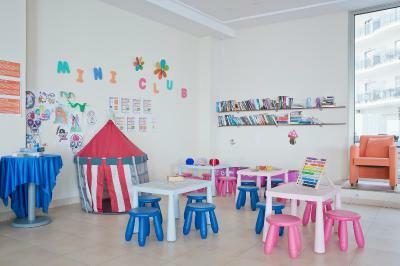 Guests benefit from an entertainment program for both adults and children in summer. 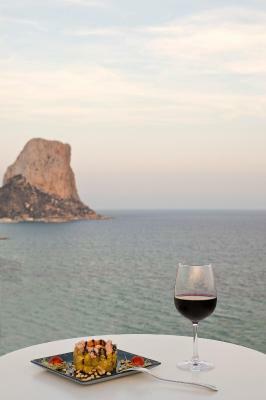 The historic center of Calpe is just a few minutes’ walk away. About 19 mi away in Benidorm you will find the theme parks of Terra Mítica, Terra Natura, Mundomar and Aqualandia. 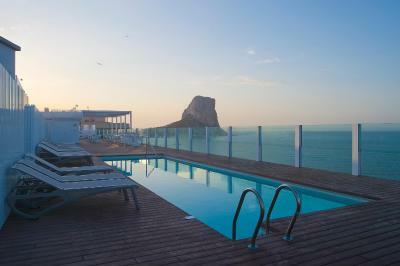 This property also has one of the top-rated locations in Calpe! Guests are happier about it compared to other properties in the area. 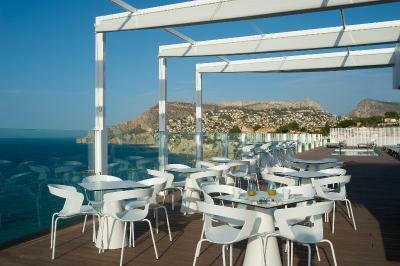 When would you like to stay at Hotel Bahía Calpe by Pierre & Vacances? This air-conditioned room has a TV, safe and mini-bar. The private bathroom comes with a hairdryer. 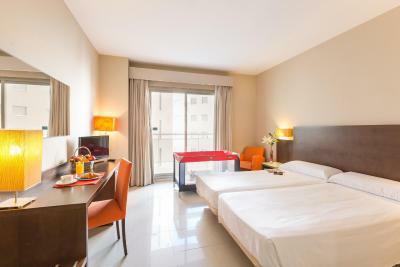 This air-conditioned room features sea views, a TV, safe and mini-bar. The private bathroom comes with a hairdryer. 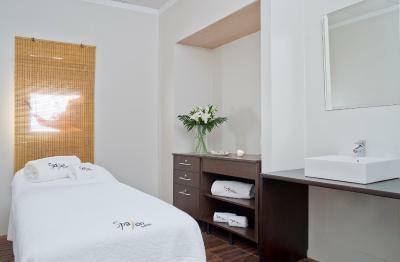 Offering sea views, this air-conditioned room has a TV, safe and mini-bar. The private bathroom comes with a hairdryer. 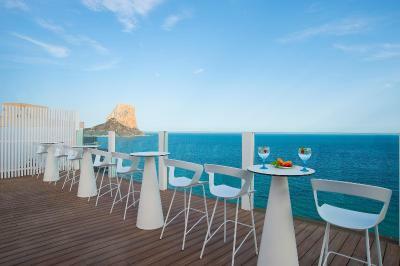 House Rules Hotel Bahía Calpe by Pierre & Vacances takes special requests – add in the next step! 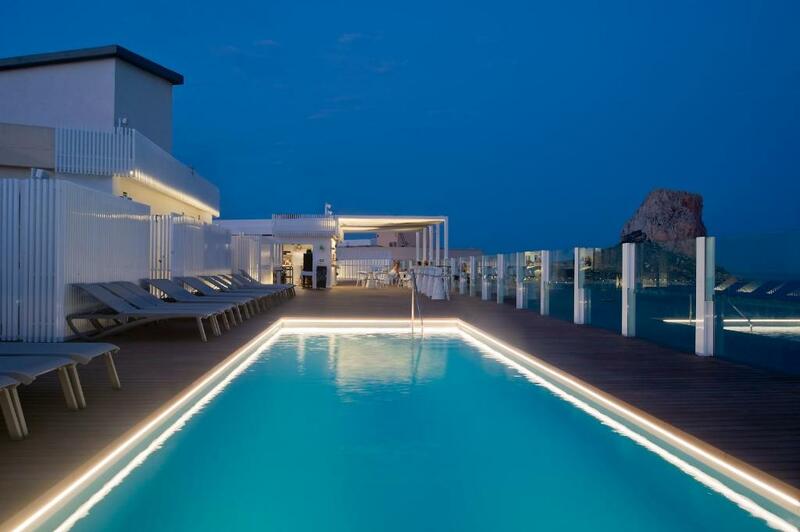 Hotel Bahía Calpe by Pierre &amp; Vacances accepts these cards and reserves the right to temporarily hold an amount prior to arrival. Hotel Bahía Calpe by Pierre & Vacances accepts these cards and reserves the right to temporarily hold an amount prior to arrival. Bed linen and towels are changed every 4 days. 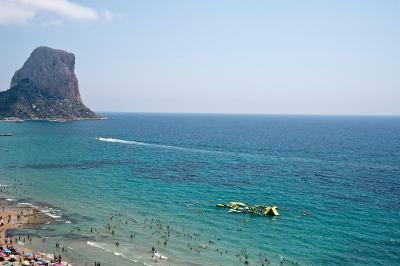 Please inform Hotel Bahía Calpe by Pierre & Vacances of your expected arrival time in advance. You can use the Special Requests box when booking, or contact the property directly using the contact details in your confirmation. Roof top pool and beach bar!! Room 614. Bathroom. On first view looked great - in use not so. Shower cubicle way too small, anyone with low mobility will struggle. At one time this obviously had a glass door on which probably made it awkward to use, now has a curtain. Nowhere to put your shampoo & shower gel so when you have to bend down to pick it up, you get wrapped in shower curtain and bang yourself on tap/shower attachment making water either red hot or freezing cold!! Using bath is marginally easier but access is limited due to a fancy 'wall with a gap'. There was only one socket in the room. Unfortunately, this was under the desk - so we had to grovel on the floor to charge our phones and tablets. Luckily, there was an Ale-Hop shop nearby and I was able to buy a long charging cable! Our room had a sea view - it was well worth paying the extra for it. Even though we were on the 5th floor we could hear the sea with the patio doors open. The bedroom (and bathroom) was well equipped with plenty of storage space. Breakfast was great. There was a huge choice of food. The only problem was that it was very busy one morning and so you had to queue for the coffee machine! The roof top bar was with a great setting and whilst we are definitely not complaining, it would have been an enhancement for us if it had stayed open for longer on the evening. Breakfast and location were excellent and we were able to park our car within the hotel secure basement car park. The hotel was very comfortable with very friendly and helpful staff. Staff on reception came across as surly. They were not overly friendly or made you feel welcome. Had an issue in the roof top bar. We asked for a food menu at 11.50am, then advised that it would be 12.30pm before it came. We agreed that was ok but said we had a taxi coming for the airport. We waited until 12.50pm still no food - asked 3 times where it was, then left at 1.10pm without having eaten. We also never managed to get served at the bar in reception. On more than 1 occasion we rang for service (it was unmanned and you had to ring a bell for service) but no-one ever came. No pool towels available. We asked at reception and were told to use our room towels. Not what you’d expect for a 4* hotel. Excellent location. 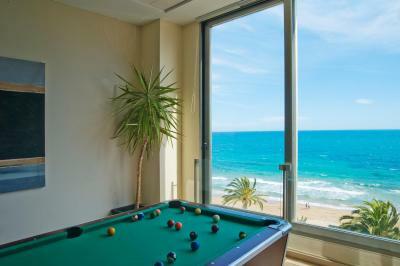 Fantastic views and roof top pool/bar. Nice hotel, great location for beach, cafes, restaurants etc. fridge and safe in the room. 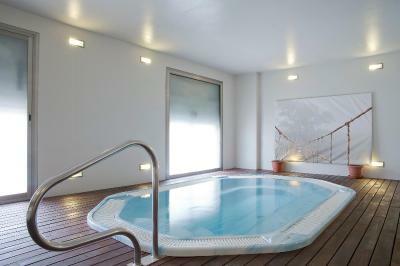 The location is fantastic with views out to the ocean and the Ifach. The rooms were very good but could have done with some small decoration to make them more homely.